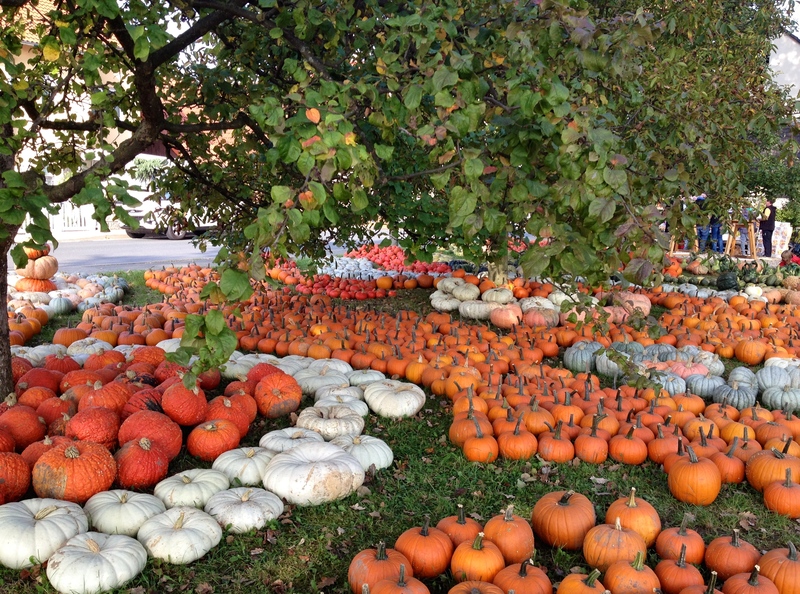 The pumpkin festival was gourd-eous! We are happily discovering that you can spend most weekends in Germany visiting various festivals and markets and never hit the same town twice. Our first weekend here–tired, jetlagged and still a little fuzzy, we spent Sunday in Altendorf. (Don’t look for it on a standard map. You probably won’t find it.) 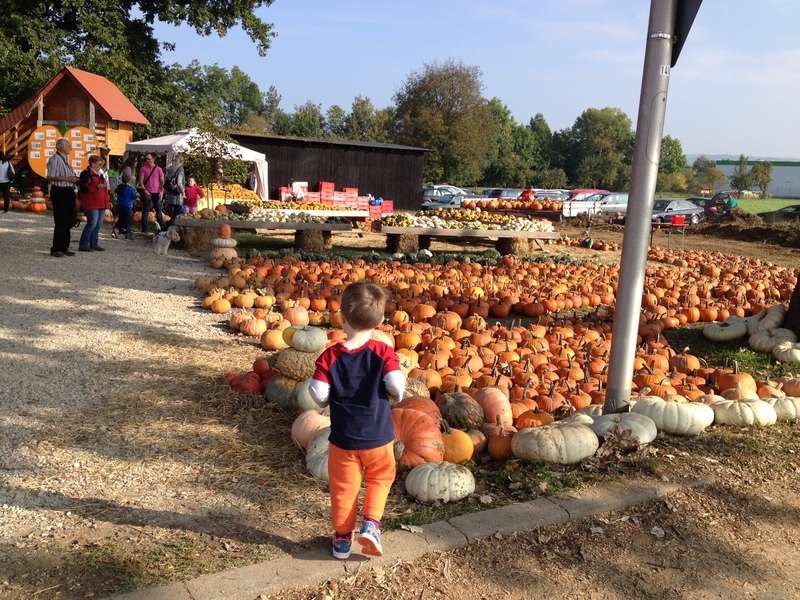 Their annual Pumpkin Festival–always held on the first Sunday in October–seems like a great way to spend a warm and sunny fall morning without making us think too hard. A co-worker of Ken’s who grew up in the area told us about it–in the best way possible: “You know Stars Hollow? On Gilmore Girls? It’s like that.” SOLD! 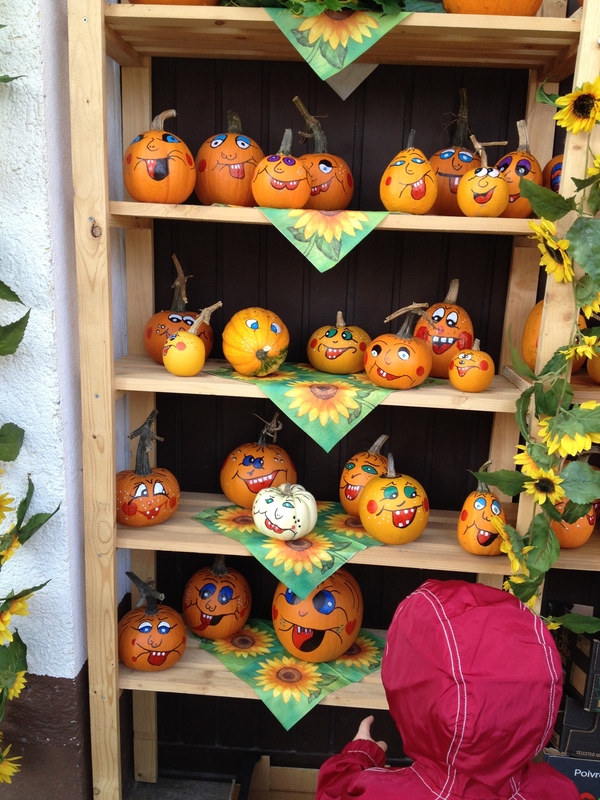 This really, really small town goes all out for all things pumpkin. 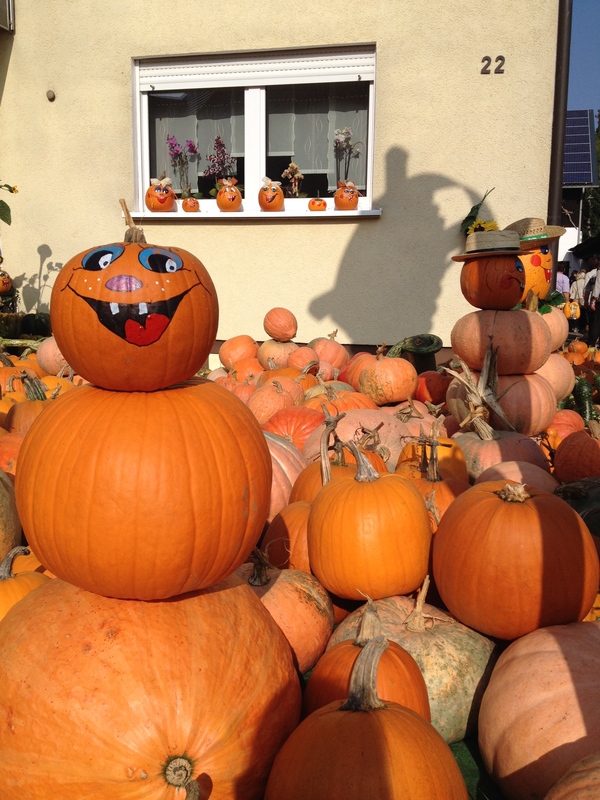 It seems that every house, barn and building is decorated with pumpkins and gourds. Some painted and decorated, some stacked like autumnal cairns and some just placed on window sills and steps. But everyone participates. The most amazing part of it is that the festival is only for one day. It must be a ton of work to haul out, decorate and place all these pumpkins, but I’m sure there is an awful lot of town pride attached to it. It should be noted that apparently pumpkins are blue-eyed when personified. The area farms and clubs set up food and drink tents and sell all kinds of seasonal delights, from the tasty Federweiser (I think it’s similar to a vino verde, where the wine is sweetish and slightly bubbly) to pumpkin-infused prosecco to soups, sausages and all manner of pastries. 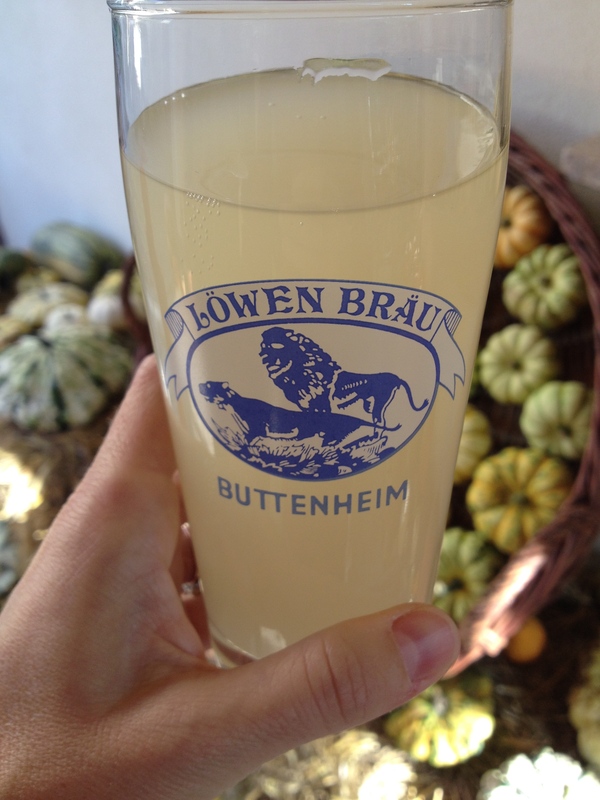 A delicious glass of Federweiser. 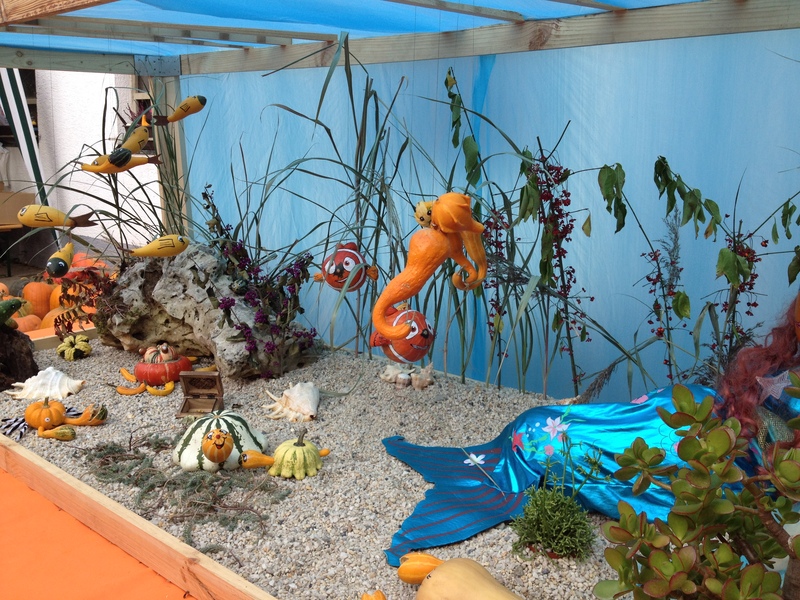 The pumpkin display that got the most oohs and ahhs was a diorama of decorated gourds meant to look like an undersea adventure. There was Nemo, turtles and crabs, seahorses and schools of fish, all loving created from gourds and hung by fishing wire against an aquarium-like backdrop. Amazing! This Enchantment Under the Sea display stole the show! We couldn’t leave without picking out at least one pumpkin of our own to take home. The challenge was deciding which one! In retrospect, the choice of pants was a mistake. We almost lost him several times.